Chaucer Covers have been dealing in autographs for over 10 years. Every item we source has been individually assessed for authenticity based upon our digital catalogue of previous known examples, our reference library of known autograph examples and in some cases by refering to a small circle of some of the most well-respected experts in the industry. An item will not appear in our magazine or on this website until we are happy with it's authenticity and history. 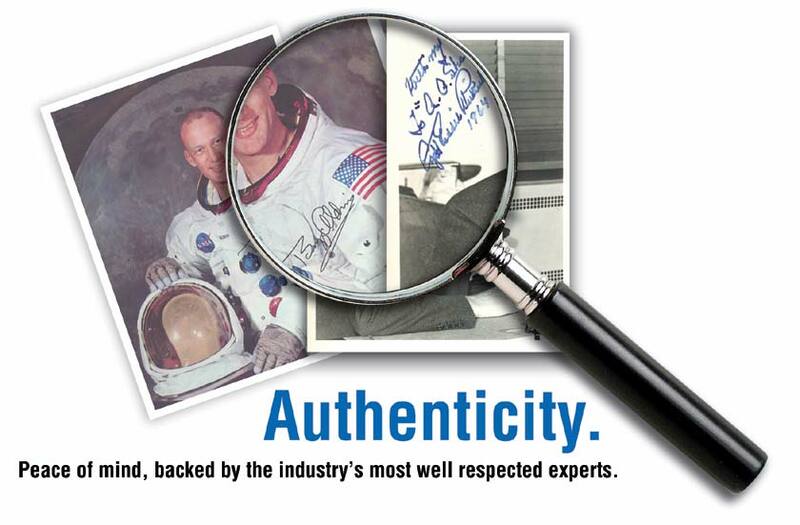 When you purchase an autographed item from Chaucer Covers, it will come complete with our Certificate of Authenticity which bears a unique code number. This number can be used to track the item and its origins. We buy from some of the world's most respected dealers as well as arranging charity signings and our close association with the world's largest autograph show Autographica. All autographed items come with our lifetime money back assurance. Customers have the right to cancel the order within seven days of receipt of the goods. If you do cancel your order, you will have your payment returned after the goods have been returned. Items are sent by Royal Mail, using suitable packing material and board backed envelopes marked 'do not bend'. Items with a value of over £50 will be sent by Recorded Delivery. Items with a value of over £100 will be sent by insured Special Delivery. Once an order is placed we aim to despatch within three working days. For more information call 0845 1304094.